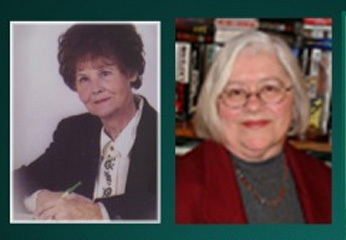 Today, Keyhole Conversations closes the poetry series with Hazel Hart (right) and Bonnie Myrick (left) reading their poetry. 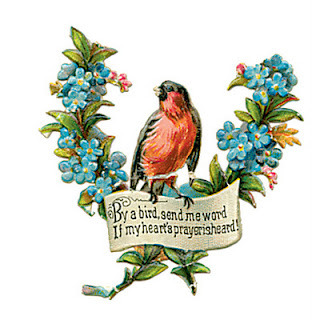 Trivia: Ever wonder who was attributed to writing the first poem? Find the answer here. Take the poll below. Which series did you enjoy most? Keyhole Conversations celebrates national poetry month with a reading by poet Conrad Jestmore. Conrad Jestmore has published short stories, poetry and non-fiction in numerous journals and anthologies. He has, over the years, earned gainful employment as a welfare case worker in the mountains of northern California, an elevator operator when elevators still had them, a bartender, a paint warehouse stocker, a USO performer and a high school teacher. 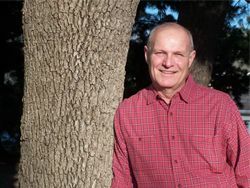 He is a Past President of Kansas Writers Association. He is a Reiki Master, and currently teaches Reiki classes and heals both humans and animals in his central Kansas Reiki practice. Keyhole Conversations continues our National Poetry Month series with poet Colleen Kelly Johnston reading poems about Ireland and family relationships. 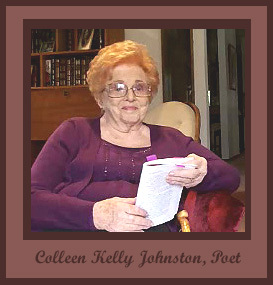 Colleen Kelly Johnston is a woman who people might not immediately recognize as a poet, as she has been a political activist most of her adult life. One aspect of that activism was her involvement with the Feminist Movement. Her essay, “I Didn’t Play with Dolls,” was published in Radiating Like a Stone: Wichita Women and the 1970s Feminist Movement. In the last few years, though, Colleen has been a serious writer of poetry and, as a result, her poems have been published and won awards all over the country. April is poetry month, and Keyhole Conversations is proud to present our first guest poet, Diane Wahto, reading her poems. Keyhole Conversations wishes to express our appreciation to Watermark Books, Wichita, Kansas, for allowing us to video tape this week’s vlog in their bookstore. Diane Wahto received an MFA in creative writing from Wichita State University in 1985. 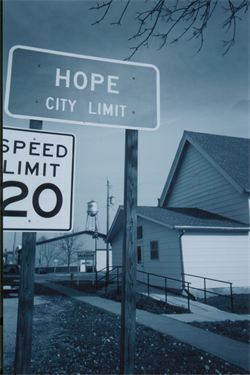 Her poetry has been published in Midwest Quarterly, AID Review, and Coalition Connections: The Feminization of Poverty. Awards include the American Academy of Poets Award, the 2011 Salina Spring Reading Series New Voice Award, and honorable mention in the 2011 KWA contest. 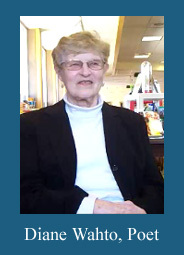 She worked as a journalism and English teacher and instructor, finally retiring from Butler Community College in 2009. She lives in Wichita with her husband and three dogs. Diane has this to say. One thing I know about writing—it has to be done every day. I write poetry, but I imagine the same is true of fiction, essay writing, or any other kind of writing people do. When I was getting a degree in creative writing, I read William Stafford’s Writing the Australian Crawl religiously. I also read other poets. Right now, I’m reading a compilation of poetry published by City Lights. Reading Allen Ginsberg is a trip. Such reading sets up a wave-like effect and I am able write. I try to follow Stafford’s advice, which is not to judge as I write. I will perfect the work later. I also belong to a writing group made of women who have a fine critical eye. Being in that group has helped me immensely. My best poems have come to me fully formed. The poem, “Somebody Is Always Watching,” one of the first poems I wrote, came to me that way. I was reading an article in the WSU Sunflower about a speaker at WSU who was a prototype for the George Smiley character in the John Le Carre novels. Suddenly, this poem formed itself in my head and I started writing. It has won two prizes for me. The poem, “Fulcrum,” came after the shooting in the Norwegian camp. I heard a young woman being interviewed on the radio. She said she hid under someone else’s body to save herself. Her voice stayed in my head and I wrote that poem. “The Man Who Never Saw the Light of Day” came to me after a conversation with my dad when we were going for a walk one day. “What Old Men Do.” I was sitting on the porch writing when my husband came outside and started talking as he worked on the bird feeder he was building. I began to write down what he was saying and that turned into a poem. “Through the Ages, the Eternal Yes” is a poem I wrote after seeing Warner Herzog’s movie about the cave in France. Don’t ask me the connection. The poem just came to me. “The Mass Has Ended” won honorable in the KWA contest last year. I wrote that after driving by the cathedral in downtown Wichita as Saturday evening mass let out. The images stuck in my head. “Marketplace” grew out of long-ago trip with my husband to Mexico. I make it sound easy. It’s not easy. I have a hundred bad poems for every one I write that I’m happy with. I have no formula for writing except that I try to leave myself open to what is floating by. I have no real secrets for writing poetry. I believe writing is organic, no matter what kind of writing a person is doing, so it’s important to let it grow of its own accord. I try to write a poem every day, no matter what else is going on in my life. I read a little bit of William Stafford’s Wriitng the Australian Crawl every day. I notice things, signs, what people do and how they talk, nature, houses, sounds, movies, TV shows (I once wrote a poem called “Cheers”). I listen to people talk. I accept every idea that comes into my head, sorting it all out later after it’s been written down. Many of my poems have come from my family situation, which was dysfunctional, but not as dysfunctional as some. Today, I’ll read a few poems dealing with my family.